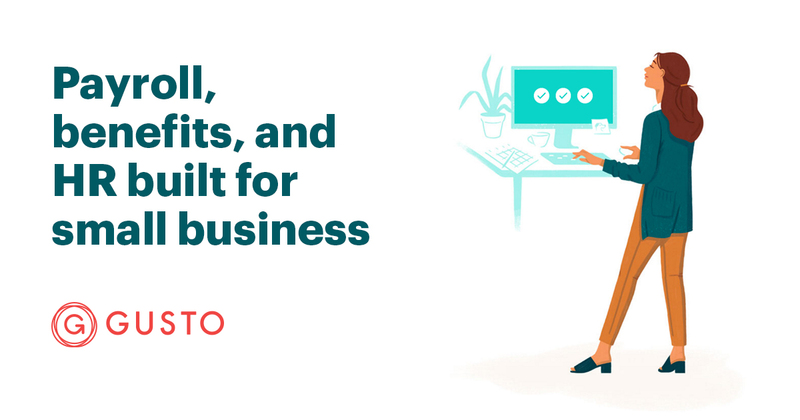 If you’re a small business owner looking for a solution that combines payroll, benefits and HR in one platform, look no further than Gusto. Time-consuming and complex processes are made simple through seamless integration and automation. You don’t have to be a payroll expert to use Gusto’s intuitive interface. This cloud-hosted software is a favorite of reviewers with top-rated customer service. Not to mention, it has a small business-friendly price tag. Plus, if you’re a ZipBooks user, you’re in luck! Gusto has partnered with us in order to provide essential HR solutions that integrate with your favorite accounting software. Try one month for free! With a wide range of features, Gusto allows for scalability and growth. Aside from benefits and HR offerings, Gusto’s full-service payroll has a comprehensive set of features. Gusto offers unlimited payroll to all users with flexible schedules and pay rates. Choose a weekly, bi-weekly, bi-monthly or monthly setup and then customize as needed. Enter relevant info for each team member—pay rate, deductions, hours—and the system automatically calculates payroll. Then, for a typical pay period, all you need to enter is hours worked and any unique circumstances like bonuses or reimbursements. It’s all done in a matter of minutes. If you do need to expedite or cancel payroll, it takes just the click of a button and these services are offered at no extra charge. Gusto provides unlimited bonus and off-cycle payrolls as well. If there’s anything you need to adjust or customize, you can. Companies with little variation in their payroll can take advantage of Gusto Payroll on AutoPilot. With Payroll on AutoPilot, paychecks are processed and deposited every pay period, without any effort on your part. If you need to, you can log in and make any changes before pay day. Otherwise, your payroll will run automatically. You can toggle this service on or off at any time (within one day of your next payroll). At no extra cost, Gusto fills out and files all payroll taxes for your small business. From new hire reporting to year-end forms, everything is generated and distributed automatically. Relevant tax forms include W-2s, 1099s, 940s, 941s, 8974s and other state and local requirements. Digital copies are emailed to employees and stored for secure access through Gusto’s dashboard. Gusto will make all required payroll payments on your business’s behalf and handle any tax form amendments. If needed, you can file in multiple states (at no extra charge). For small businesses, it’s critical to find a payroll solution than can handle both full- and part-time employees, hourly and salaried, W-2 and 1099. Gusto gives you the flexibility to handle all employee types the same way and the flexibility to run payroll as often as you like (based on varying team member schedules). When onboarding, you designate what type of worker a new hire is and the software takes it from there. Your monthly base price is consistent, regardless of the varying types of employees you have on file. You just pay the “per person” cost for any active employees being processed that month. (If you are not paying a contractor one month, you will not be billed for them). Gusto not only pays new employees, but helps them feel welcome right away. Once you’ve added an employee’s name and contact info to the system, they get a celebratory email welcoming them to your team and inviting them to fill out onboarding paperwork online. Employees set up a lifetime account, so they can access their payroll history even if they leave your company. You don’t have to worry about entering any personal info or updating it later on; they manage all the sensitive details on their own (social security number, tax withholding preferences, direct deposit information, etc). With Gusto’s self-service dashboard, employee onboarding is fast, efficient and completely paperless. From this same dashboard, you can manage e-signing, time off requests, team messaging, and digital paystubs. All records are maintained electronically so there’s no risk of losing paperwork or data entry errors. Gusto’s customer service representatives are lauded as prompt, helpful and thorough. You can contact customer service via chat, email or phone on weekdays from 6am-5pm PST. One reviewer appreciated that throughout their whole conversation, Gusto never pressured them to commit to their service; instead, they focused on the needs of their small business. They also have a comprehensive help center with articles and video guides available 24/7. Whether it’s January or June, you can switch over to Gusto in just 10 steps. Set up is well-organized and explained with an intuitive interface. Additionally, you’ll live chat with customer service as you’re setting up, getting answers to questions as you ask them. If you have 10 employees or more, just hand over the paperwork to Gusto and they’ll import all your payroll data. If you have less than 10 employees, self-onboarding can save you a lot of time and gives employees full control over their information. Gusto offers month-to-month pricing, with no additional costs to set up or cancel. Choose between three tiers of pricing—all of which include full-service payroll, employee log-ins, benefits administration and customer support. Switch between tiers at any time. The Core plan starts at $45 per month, while the Concierge plan has a base monthly rate of $149. The biggest differences between the plans are the HR resources included. The Concierge plan is the most feature-rich, with a 24/7 HR resource center that includes services like HR compliance help, a custom employee handbook and a dedicated support team. This is especially beneficial to small businesses without a full-time HR team. You can customize any plan with add-ons such as health benefits or workers’ comp insurance. Contractors and employees have the same “per person” cost. However, you only are only billed for contractors in the months that you pay them. (Employees, on the other hand, are always included in the monthly price). Gusto also offers a one-month free trial to all new users. It’s free to set up your account and your trial starts after you run your first payroll. There’s also an interactive instant demo that allows you to explore all of Gusto’s features for free without setting up an account. Rather than handing you off to a partner agency, Gusto serves as a licensed broker, customizing your benefits offerings based on your needs. Employees are automatically notified of their benefits options and enroll themselves online (typically open enrollments lasts one week). Team members will enter their relevant personal information and health history, so you don’t have to mess with confidentials. From their Gusto login, employees can update dependents, addresses, names, etc. for your approval. Benefit selections are synced directly with payroll; Gusto will automatically deduct individual amounts from employee paychecks. Health benefits administration, including medical, vision, dental, life and disability insurance, are available on every Gusto plan. There are no additional set up fees for using health benefits—you only pay for monthly premiums. Gusto is partnered with more than 100 health benefit carriers, so you have access to over 3,500 different plans. Health benefits are currently only available in 24 states—Arizona, California, Colorado, Florida, Georgia, Illinois, Maryland, Massachusetts, Michigan, Minnesota, Missouri, Nevada, New Jersey, New York, North Carolina, Ohio, Oregon, Pennsylvania, Tennessee, Texas, Utah, Virginia, Washington, and Washington DC—but they are working to expand. If you are already signed up for a health plan when you switch to Gusto payroll, odds are you can merge your existing health account with Gusto’s platform. Gusto has partnered with Guideline to offer seamless syncing with payroll and retirement saving. There is a one-time set up fee of $500 and a monthly minimum of $40. However, participants only pay 0.07% for their portfolios, and business owners only pay $8/month per participant. Guidelines helps you to stay compliant, match employee contributions, and stay up-to-date, all online. Again, employees enroll themselves through the Gusto dashboard, so there’s no clunky paperwork to stress about. To keep your employees safe, Gusto helps you enroll in workers’ comp insurance for no additional charge (aside from monthly premiums). Through their partner, AP Intego, you can enroll online and pay-as you-go. The application only takes a few minutes and you’ll receive a price estimate right away. Final policy quotes are usually offered within one business day. Show employees that you care for them and their families by integrating 529 college savings plans with Gusto payroll. Partnered with Gradadvisor, Gusto automatically deducts 529 contributions from every paycheck, so you don’t have to worry about it. Setup is free, but there is an $18 per month minimum, plus another $6 per month per participant. Employees receive expert investment advice from Gradadvisor and you have the option to match contributions. 529 benefits are available in all 50 states. From the hassle of onboarding to the delicacy of termination, Gusto gives you the tools and resources you need to make HR a breeze. Employee onboarding is all done online (regardless of which plan you choose). Team members input all their relevant data themselves, saving you time. You can also welcome new hires and send messages and documents through the system itself. Employee’s have access to your customized handbook (Concierge plan only) and you can manage teams with organization charts and workflows. Additionally, when you want to get feedback from employees, you can send out anonymous surveys. Sync time tracking with your payroll processor. Allocate vacation days and sick days or manage time off requests. Key dates automatically populate on your calendar. Push through time tracking to payroll with just one click. All three tiers include paid time tracking. However, only Complete and Concierge plans can handle time off requests and policies. With the Concierge plan, you’ll have access to a dedicated HR professional as well as a plethora of resources. Gusto’s HR Pros will help you protect your business legally and avoid expensive compliance mistakes. Tech review sites validate these claims. PC Mag rated Gusto their top choice for payroll in 2018 and Capterra reviewers average 4.5 stars (4.3 on G2 Crowd). While Gusto is often rated the top payroll processor for small businesses, there are alternative options if you are looking to compare pricing, features, etc. If you don’t need the bells and whistles, Square Payroll is an affordable solution from a trusted brand. The reception for Square Payroll has been largely positive, especially from small businesses who are already using Square POS. They also offer the unique option to choose an independent contractors-only plan with no monthly subscription fee. SurePayroll is a basic payroll solution for small businesses and individuals. They feature many industry-specific plans (clergy, nonprofit, etc.) and especially cater to homes with nannies or household employees. Additionally, their product can be resold by accountants. They are known for their customer service and tax compliance guarantee, and enjoy the backing, benefits, and resources of a large corporation. However, they do tack on additional charges for add-ons like multiple state filing and time tracking or accounting integrations. If you are looking for a payroll option that will scale with your business, Inova Payroll might be a good fit. Inova offers solutions by size and industry as well as à la carte features. The company prides themselves on exceptional customer service and offers a Two Year Price Guarantee. There are many add-ons available including benefits administration, talent management and virtual HR help. If you’re a ZipBooks user, you’re in luck! Gusto has partnered with us in order to provide essential HR solutions that integrate with your favorite accounting software. If you pay contractors or employees, producing and recording an accurate payroll is essential to your business bookkeeping. To make the process even easier, link Gusto and ZipBooks together so that all of your payroll records are in one place. Try it for free! Try Gusto + ZipBooks for Free! Sign up through your ZipBooks account to seamlessly combine smart accounting with the best payroll solution for your business!